1. $1 million in tournament earnings in 2010. In order to do that you have to have at least one chunky score throughout the year, but over the years I've usually found my way there. 1999 $ 354,727 (Back then my 1998 and 1999 numbers were really huge. Tournaments were smaller and the only $10k event was the main event. I did with the U.S.P.C. at the Taj Dec 99'. 3. 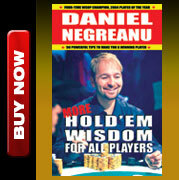 Stay #1 on the WPT all-time money leader list. I haven't had any big scores on the WPT lately, but hope to make a deep run or two this year. My closest competitor is Carlos Mortensen. 4. Two WSOP Bracelets. I've never done it, but it's the one area where I feel like I'm most far behind where I want to be. I have had this bizarre string of seconds that just aren't typical for me career wise. My first 8 tournaments I got heads up I was 8-0. At the WSOP I've got 4 wins, 4 seconds, and 2 thirds. I feel like I should have 6 bracelets by now. I'd like to keep up a pace of 1 bracelet every other year. I started in 1998, so this coming year is year #13 for me. Two bracelets would get me closer to that pace. 5. One Tour Win. I'd like to get another win on the WPT, but will take a win on the EPT, LAPT, APPT, or any of the various tours sponsored by PokerStars. There are a lot of options and I plan on dabbling with all of the tours this year. 6. Move up to 12th on the WSOP all-time cash list. I currently sit 16th on the all-time in the money list, and I think I may be able to realistically move up four spots with some consistent results at the WSOP. I've had 17 cashes in the last two years for a total of 43. Currently tied for 12th place are Mike Sexton and Thor Hansen with 46. I'd need to cash at least 7 times to have a realistic shot at passing both of those guys as I expect them to cash about 3-4 times also. 7. Move up to 25th on the WSOP all-time money list. I'm at 28th right now, but without big NLH scores or a big run in the main event or the 50k it's hard to move up too far on this list. Dan Harrington currently sits in 25th place with $3,524,47 while I've got $3,383,080. I still don't plan on playing preliminary events. I quit doing that years ago, although I may play the big events at the PCA and possibly in LA for the LAPC. Otherwise it's the WSOP, and the main events at the various spots on the tour. If I accomplish 5 out of the 8 goals I'll be satisfied with my year. Last year I had only one goal: pass Jamie Gold on the all-time money leader list and did that. 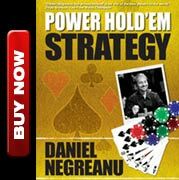 This year I'm getting a little more specific with what I want to accomplish in poker.